What are causes and risk factors for binge eating disorder? What are binge eating disorder symptoms and signs? How do health care professionals diagnose binge eating disorder? What is the treatment for binge eating disorder? Is it possible to prevent binge eating disorder? Where can people get help and more information on binge eating disorder? Binge eating disorder is a mental illness whose characteristics include recurring episodes of binge eating without the affected individual's effort to make up for the binge episodes by excessively exercising, purging, and/or inappropriately using medications like diet pills or laxatives. Binge eating disorder affects about 2% of men and 3.5% of women, with most developing the affliction during their teens or early adulthood. Men make up about one-third of people with binge eating disorder. About 65% of people with binge eating disorder are obese, and many are overweight. feeling depressed, disgusted, or guilty after overeating. There appears to be no one specific cause for binge eating disorder. Lisdexamfetamine (Vyvanse), topiramate (Topamax), serotonergic (SSRI) medications, and sibutramine (Meridia) may reduce the amount and number of binge episodes. Psychotherapy can be a key component of treatment of the emotional problems associated with binge eating disorder. People with binge eating disorder are at greater risk of developing another psychiatric condition, including a substance-use disorder or another eating disorder. Individuals with this eating disorder can also result in many people having a greater risk of developing type II diabetes, abnormal cholesterol levels, and high blood pressure, as well as a tendency to engage in self-injurious behaviors or having suicidal thoughts or actions compared to similar-weight individuals without this illness. Educating teenagers and adults about resisting society's pressure to be thin, understanding factors that affect body weight and the negative health aspects of eating disorders, as well as encouraging stress management, good self-esteem, healthy weight control, and acceptance of their bodies can help prevent eating disorders, including binge eating disorder. Binge eating disorder is a mental health condition that is characterized by recurrent episodes of binge eating without efforts on the part of affected individuals to compensate by undoing the binge episodes. Examples of such undoing behaviors include purging food by inducing vomiting, excessively exercising, and/or inappropriately using medications like laxatives or diet pills. This illness was often previously described by mental health professionals under the diagnosis of eating disorder, not otherwise specified rather than as its own separate entity, but the most recent revision of the widely accepted diagnostic manual used by mental health professionals has included binge eating disorder as a separate diagnosis. Statistics about binge eating disorder indicate that this condition is the most common of all eating disorders, affecting about 3.5% of women and 2% of men over the course of a lifetime. As with other eating disorders like anorexia nervosa or bulimia nervosa, there tends to be no significant difference in the age at which males and females develop binge eating disorder. Males with eating disorders like binge eating disorder tend to have a much higher body mass index (BMI) and are more likely to also suffer from attention deficit hyperactivity disorder (ADHD) compared to males of similar age without the disorder. Females with eating disorders like binge eating disorders are at increased risk for also having celiac disease and diabetes. Binge eating disorder is apparently quite common in individuals who seek treatment for obesity in weight-loss programs that are affiliated with a hospital. About one-third of individuals with this condition are males. Most develop the disorder during adolescence or early adulthood, primarily in early adulthood. There seems to be no difference in the incidence of binge eating disorder among ethnic groups. Binge eating disorder can have a significant impact on the health of those who suffer from it. Specifically, about 65% of people with binge eating disorder are obese (20% overweight or more), with even more being generally overweight. Individuals who develop binge eating disorder are at higher risk of also having another psychiatric illness, like depression, anxiety, and substance abuse. Women with this illness tend to suffer from a negative body image, whereas men are more likely develop a substance-use disorder. Other important facts about binge eating disorder include its tendency to last for more than 14 years, with only 7% resolving after the first year of having the illness. When compared to other eating disorders like bulimia nervosa or anorexia nervosa, which each tend to last less than six years, binge eating disorder has more of a chronic course. As with most other mental disorders, there is no one specific cause for binge eating disorder. Rather it is the result of a complex group of genetic, psychological, and environmental contributing factors. People who are prone to obesity, either genetically or otherwise, tend to be more at risk for engaging in binge eating episodes and developing binge eating disorder compared to those who are not obese. There is increasing understanding that there can be a genetic component to binge eating disorder, and as with other eating disorders, there are often found to be abnormal levels of brain serotonin and often subtle changes in brain functioning. Social risk factors for binge eating disorders include a history of being bullied or physically or sexually abused. For Caucasian women as opposed to African-American women, discrimination tends to be a risk factor for this disorder, as well. Other risk factors for binge eating disorder include more exposure to negative comments about shape, weight, and eating. People who participate in competitive sports at an elite level are at higher risk for developing eating disorders in general. Psychologically, binge eating disorder is thought of by many professionals to be a form of food addiction that is characterized by compulsive overeating. This condition tends to be associated with increased perfectionism, obsessive-compulsiveness, depression, anxiety, and substance-use disorders. Phobias and panic disorder are the most common anxiety problems experienced by people with binge eating disorder. Eating binges tend to be triggered by a number of things, like dietary restrictions, hunger, and negative moods. Also, the individual with binge eating disorder experiences marked distress regarding their binge eating. As is true with virtually any mental health diagnosis, there is no one test that definitively indicates that someone has binge eating disorder. Therefore, health care professionals assess this disorder by gathering comprehensive medical, family, and mental health information. The health care professional will also either conduct a physical examination or ask that the individual's primary care doctor perform one. The medical assessment will usually include lab tests to evaluate the person's general health and to explore whether or not the person has a medical condition that has what appear to be mental health symptoms. In asking questions about psychological symptoms, mental health professionals are often exploring if the individual suffers from symptoms that meet diagnostic criteria for binge eating disorder or another eating disorder, like anorexia nervosa and bulimia nervosa, as described in the Diagnostic and Statistical Manual of Mental Disorder, Fifth Edition (DSM-V). To qualify for the diagnosis of binge eating disorder, the person must engage in bingeing at least once per week for three months. The DSM-IV-TR and earlier editions of the diagnostic handbook did not include binge eating disorder as a diagnosis. Rather, it was captured under the diagnosis of Eating Disorder, Not Otherwise Specified (ED, NOS). Practitioners will also explore whether symptoms of depression and/or mania, anxiety, substance abuse, hallucinations or delusions, as well as some behavioral disorders are occurring. People with binge eating disorder may seem to engage in compulsive eating, having symptoms in common with obsessive compulsive disorder (OCD). Health care professionals may provide the people they evaluate with a quiz or self-test as a screening tool for binge eating disorder and other eating disorders. Since some of the symptoms of binge eating disorder can also occur with other conditions, the mental health screening is designed to determine if the individual suffers from any emotional problem. In order to assess the person's current emotional state, health care professionals conduct a mental-status examination, as well. As with obese individuals without binge eating disorder, people with this illness tend to lose weight from adopting a low-calorie diet and engaging in regular exercise, and some will experience repeated weight gain in the long term. While considered adjunctive rather than primary forms of treatment, home remedies like meditation may help reduce the frequency and severity of binge eating disorder symptoms, thereby decreasing the impact of those symptoms on the self-rating scale. Medications that have been found to be effective in reducing the number and amount of binge episodes in binge eating disorder include lisdexamfetamine (Vyvanse), which is used to treat attention deficit hyperactivity disorder (ADHD) and has been approved by the U.S. Food and Drug Administration to treat binge eating disorder, topiramate (Topamax), which is used to treat seizures, as well as serotonergic (SSRI) medications that treat anxiety (antianxiety medications) or depression (antidepressants), like fluoxetine (Prozac), sertraline (Zoloft), paroxetine (Paxil), citalopram (Celexa), escitalopram (Lexapro), vortioxetine (Trintellix), and vilazodone (Viibryd). Sibutramine (Meridia) is an appetite suppressant that has been found to help decrease binge eating and enhance weight loss. SSRIs tend to be well tolerated and have a low incidence of side effects like stomach upset, sleep problems, and sexual dysfunction. Topiramate was first used to treat seizures and is sometimes stopped by patients because of daytime sleepiness, difficulty thinking, and poor coordination. Sibutramine's most common side effects include headache, constipation, stomach upset, insomnia, and painful menstrual periods. Less common, more serious side effects of sibutramine include palpitations, chest pain, shortness of breath, nausea, and vomiting. While psychotherapy alone does not tend to result in long-term weight loss in individuals with binge eating disorder, it can be a key part of the rehabilitation ("rehab") and recovery from the emotional problems that are often associated with this disorder. Two forms of psychotherapy that have been found to be effective in that regard include cognitive behavioral therapy (CBT) and interpersonal therapy (ITP). In cognitive behavioral therapy, the mental health practitioner works to help the person with binge eating disorder identify, challenge, and decrease negative thinking and otherwise dysfunctional belief systems that precipitate unwanted behaviors. Dialectical behavior therapy, which is a specific form of cognitive behavioral therapy that focuses on emotional regulation, has also been found to be an effective means of increasing the length of time between binge episodes (for example, binge abstinence) in preliminary studies. The goal of interpersonal therapy tends to be identifying and managing problems the sufferer of binge eating disorder may have in his or her relationships with others. Participation in one of a number of self-help support groups, like Overeaters Anonymous or Eating Disorders Anonymous, can also be an important part of managing this condition by enhancing the sufferer's self-control in regard to their food intake. Understanding and addressing how to treat other mental health problems that might co-occur (comorbidity) with binge eating disorder are important aspects of overcoming this illness. For example, as about 57% of men and 28% of women with binge eating disorder also have a substance-use disorder, treating both problems will enhance the successful recovery from each illness. People with binge eating disorder seem to be at higher risk of developing substance abuse or another psychiatric illness, high blood pressure and other forms of heart disease, type II diabetes, gallbladder disease, some forms of cancer, and abnormal cholesterol levels (for example, high levels of total cholesterol and of so-called bad cholesterol types, plus low levels of good cholesterol) compared to similar-weight individuals without this eating disorder. The obesity that often results from binge eating disorder also puts sufferers at risk for problems like menstrual problems and joint and muscle pain. Pregnant women are at risk for developing problems with the pregnancy like hyperemesis, having babies who have low birth weight, excessively small skulls (microcephaly), and are small for gestational age. Given these potentially life-threatening complications of binge eating disorders, the decreased likelihood that ethnic minorities in the United States seek and are referred for specific treatment is an important obstacle to overcome. After about six years, a little more than half of individuals with binge eating disorder who have engaged in intensive treatment have been found to have some significant decrease in symptoms, while about one-third have only intermediate outcome, about 6% have poor outcome, and 1% may die during that period of time. Having one eating disorder increases the risk that the sufferer will develop another one. Eating disorders in general and binging behavior specifically can increase the likelihood that a person engages in self-injurious behaviors like cutting or has suicidal thoughts or actions. However, it is important to note that the prognosis of binge eating disorder seems to be quite changeable over time. Teaching teens and adults about resisting society's pressure toward thinness, understanding what determines body weight, the negative effects of eating disorders, and encouraging good self-esteem, stress management, healthy weight control, and acceptance of their body have been found to be helpful in the prevention of eating disorders. Educating the adults in the lives of youth about how to positively influence children regarding healthy eating habits, exercise and body image have also been determined to be helpful components in preventing binge eating disorder. In addition to parents, key adults in this approach can include teachers and other school staff, coaches, pediatricians, and other primary care doctors. American Psychiatric Association. Diagnostic and Statistical Manual of Mental Disorders, 5th Edition. Arlington, Virginia: American Psychiatric Association, 2013. American Psychiatric Association. Diagnostic and Statistical Manual of Mental Disorders, 4th Edition. Treatment Revision. Washington, D.C.: American Psychiatric Association, 2000. American Psychiatric Association. Practice Guideline for the Treatment of Patients With Eating Disorders, 3rd Edition. Washington, D.C.: American Psychiatric Association, May 2006. Bohon, C., E. Stice, and E. Burton. "Maintenance factors for persistence of bulimic pathology: a prospective natural history study." International Journal of Eating Disorders 42 (2009): 173-178. Bulik, C.M., K.A. Brownley, and J.R. Shapiro. "Diagnosis and Management of Binge Eating Disorder." World Psychiatry 6.3 Oct. 2007: 142-148. Davis, C., and J.C. Carter. "Compulsive Overeating as an Addiction Disorder: A Review of Theory and Evidence." Appetite 53.1 Aug. 2009: 1-8. Eating Disorders Foundation of Victoria. "Eating Disorders and Binge Eating Information Sheet." (2006). Fairburn, C.G., H.A. Doll, S.L. Welch, et al. "Risk Factors for Binge Eating Disorder: A Community-Based, Case-Control Study." Archives of General Psychiatry 55.5 May 1998: 425-432. Hudson, J.I., E. Hiripi, H.G. Pope, and R.C. Kessler. "The prevalence and correlates of eating disorders in the National Comorbidity Survey Replication." Biological Psychiatry 61.3 February 2007: 348-358. Hudson, J.I., J.K. Lalonde, C.E. Coit, et al. "Longitudinal Study of the Diagnosis of Components of the Metabolic Syndrome in Individuals With Binge-Eating Disorder." American Journal of Clinical Nutrition 91.6 June 2010: 1568-1573. Iacovino, J.M., D.M. Gredsya, M. Altman, and D.E. Wilfley. "Psychological treatments for binge eating disorder." Current Psychiatry Report Aug. 2012. Kaye, W. "Neurobiology of anorexia and bulimia nervosa." Physiology of Behavior 94 (2008): 121-135. Kostro, K., J.B. Lerman, and E. Attia. "The current status of suicide and self-injury in eating disorders: a narrative review." Journal of Eating Disorders 2 (2014): 19. Kristeller, J.L., and C.B. Hallett. "An Exploratory Study of a Meditation-based Intervention for Binge Eating Disorder." Journal of Health Psychology 4.3 May 1999: 357-363. McElroy, S.L., L.M. Arnold, N.A. Shapira, et al. "Topiramate in the Treatment of Binge Eating Disorder Associated With Obesity: A Randomized, Placebo-Controlled Trial." American Journal of Psychiatry 160 Feb. 2003: 2. Mental Health and Spiritual Health Care. Eating Disorders: Best Practices in Prevention and Intervention 2006. Mirch, M.C., J.R. McDuffie, S.Z. Yanovski, et al. "Effects of Binge Eating on Satiation, Satiety, and Energy Intake of Overweight Children." American Journal of Clinical Nutrition 84.4 Oct. 2006: 732-738. Musci, R.J., S.R. Hart, and N. Ialongo. "Internalizing Antecedents and Consequences of Binge-Eating Behaviors in a Community-Based, Urban Sample of African American Females." Prevention Science 2013. Pope, H.G., J.K. Lalonde, L.J. Pindyck, et al. "Binge Eating Disorder: A Stable Syndrome." American Journal of Psychiatry 163 Dec. 2006: 2181-2183. Sinha, S., and N. Warfa. "Treatment of eating disorders among ethnic minorities in western settings: a systemic review." Psychiatria Danubina 25(suppl 2) (2013): 295-299. Stice, E., H. Shaw, E. Burton, and W. Wade. "Dissonance and Healthy Weight Eating Disorder Prevention Programs: A Randomized Efficacy Trial." Journal of Consulting Clinical Psychology 74.2 Apr. 2006: 263-275. Striegel-Moore, R.H., F.A. Dohm, K.M. Pike, et al. "Abuse, Bullying, and Discrimination as Risk Factors for Binge Eating Disorder." American Journal of Psychiatry 159 Nov. 2002: 1902-1907. Sundgot-Borgen, J., and M.K. Torstveit. "Prevalence of Eating Disorders in Elite Athletes Is Higher Than in the General Population." Clinical Journal of Sport Medicine 14.1 Jan. 2004: 25-32. United States. Food and Drug Administration. "FDA expands uses of Vyvanse to treat binge-eating disorder." U.S. Food and Drug Administration Jan. 2015 Silver Spring, Maryland. Wallace, L.M., P.C. Masson, D.L. Safer, and K.M. Ranson. "Change in emotion during the course of treatment predicts binge abstinence in guided self-help dialectical behavior therapy for binge eating disorder." Journal of Eating Disorders 2 (2014): 35. Welch, E., A. Ghaden, and I. Swenne. "A comparison of clinical characteristics between adolescent males and females with eating disorders." BMC Psychiatry 2015: 1-7. Westerburg, D.P., and M. Waitz. "Binge eating disorder." Osteopathic Family Physician 5.6 Nov.-Dec. 2013: 230-233. Yager, J. "Binge Eating Disorder: The Search for Better Treatments." American Journal of Psychiatry 165 Jan. 2008: 4-6. Yager, J., M.J. Devlin, K.A. Halmi, et al. Practice Guideline for Treatment of Patients with Eating Disorders, Third Edition. American Psychiatric Association, 2010. What is binge eating disorder? Learn symptoms and treatment for binge eating disorder, and start learning how to overcome binge eating disorder. Please share your personal or family's experience with binge eating disorder. What were the signs of a binge eating disorder in a friend or relative? What types of treatment did you or a relative receive for a binge eating disorder? Were you, a friend, or relative at risk for developing a binge eating disorder? Please share your story. Learn about signs, symptoms, treatment, and recovery for this eating disorder. Get to know how binge eating affects emotional and mental health. Do you binge eat? 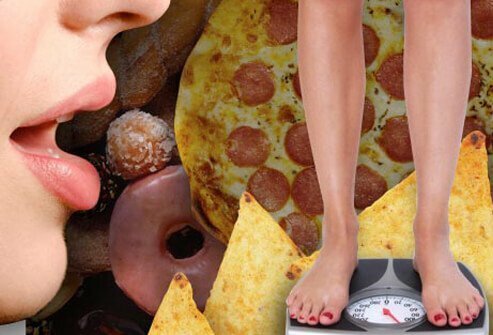 Take this quick quiz to learn what binge eating is and what makes people do it. Learn about different types of eating disorders. Discover the warning signs of binge eating disorder, anorexia and bulimia. Read about symptoms, causes and treatments for eating disorders such as anorexia, bulimia, and binge eating.